Americans, such as myself, have long enjoyed ‘snow cones’ during the hot summers of childhood. ‘Slushees’ have also been a fun frozen treat. And in Hawaii, the locals love ‘shaved ice’. I guess it comes as no surprise, that Italians have their own unique-textured, flavored fruity ice treats. If you’re going to Italy, put this on your must-try list. And make sure that you try a few along the nail-biting cliffs of Amalfi, where the freshest of citrus ingredients infuse the ice! Where you can find a sharp turn with a ‘look-out’ place to stop, there is usually a local person selling granita along with other fresh fruits and vegetables. 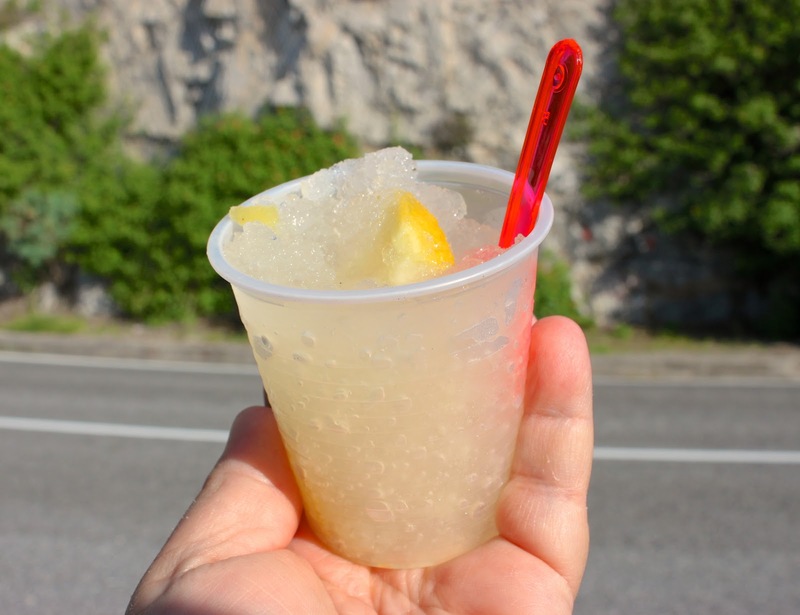 Lemon is the most popular of all Italian ices and what I loved when I visited Amalfi. When it’s boiling outside on a hot summer’s day, there are few frozen treats that can top the tangy and revitalizing taste of lemon. Granita is an Italian frozen ice mixture made from fruit, fruit juices, purées, sugar, and possibly other additional natural flavors. It is neither an American snow cone or an Hawaiian shaved ice where the ice crystals have flavored syrups poured on top; the fruit or puree/juice are added before freezing and are part of the process of producing the granita. It’s related to sorbet, but is uniquely distinct by its coarse, crystalline texture and contains no egg or dairy ingredients. You can find granita all over Italy, but how it is prepared, and thus its texture, varies from city to city. In some places, such as Palermo, the granita has a coarse texture versus the smooth sorbet-like granita served in other places. The coarser versions are frozen first, as I do in my kitchen, and then scraped. Scraping causes the ice crystals to separate whereas the smoother version is made in a gelato machine. Common and traditional flavoring ingredients include freshly-squeezed lemon juice, oranges, cherries, raspberries, wild strawberries and mulberries, watermelon, coffee, almonds, and mint. Coffee-flavor infused granita can be found in Messina, and you can even find some fantastic chocolate granite in Catania. As you can see in the photo below from my trip to the Amalfi Coast, it is served simply in a small plastic or paper cup with a tiny spoon. 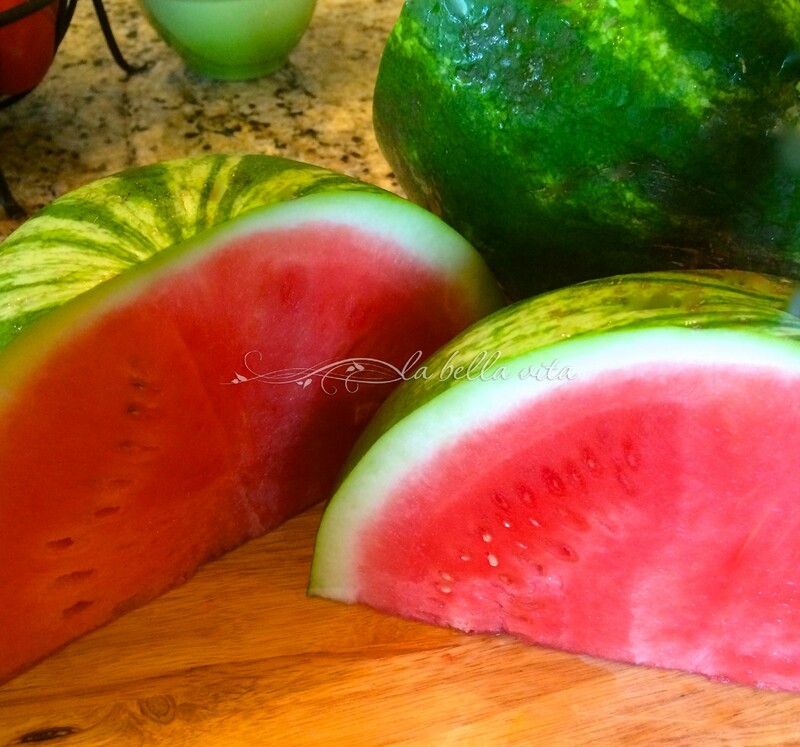 If nothing else, the brilliant rose-pink-red color of a fresh watermelon is so PRETTY! 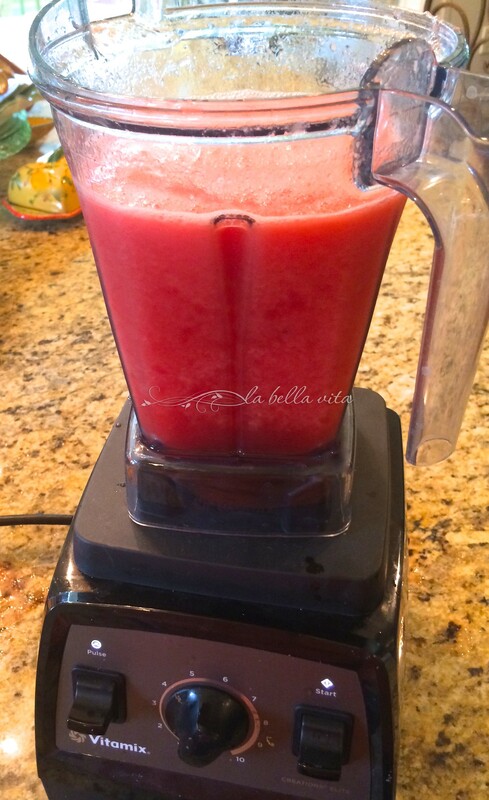 Fill the entire blender with chunks of watermelon (above photo). Give everything a whirl for about 30 – 60 seconds. Lay flat inside a freezer and freeze overnight. Next day, take a fork and scrape the entire frozen mixture. This is going on my To Make list .. It looks so beautiful and I can just imagine how refreshing it is on a hot humid day! 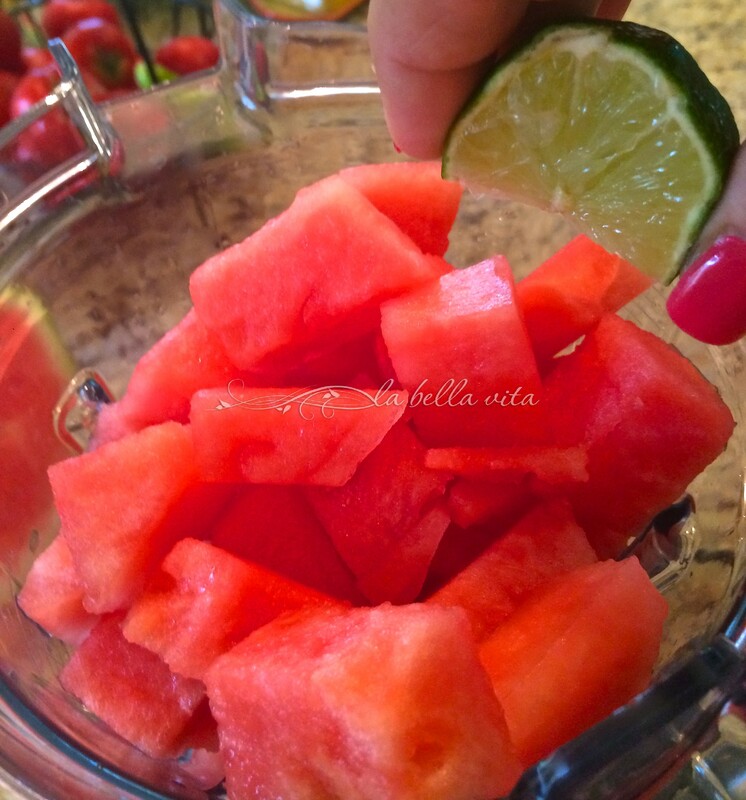 There is nothing more refreshing than watermelon. Thanks for a great idea! Watermelon is always such a sweet, cold treat . . . I love it year-round! I wish I had picked up a watermelon this morning when I was in ALDI. This granita looks totally refreshing. Thank you Angie . 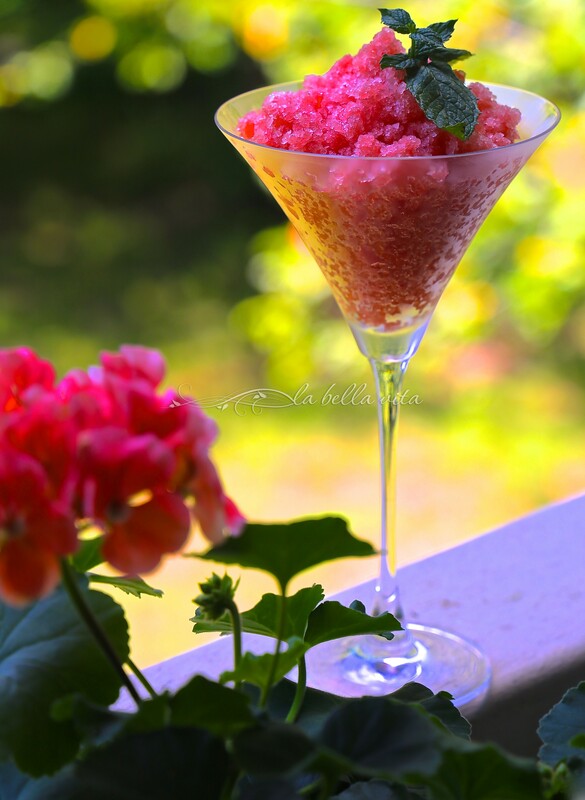 . . granita is always a refreshing way to end a meal or for a simple afternoon treat! Oh my, Roz! Your pictures are a sight for sore desert eyes! So beautiful! I absolutely love anything icy. I didn’t really know what a granita was so am glad to find out about it. The ingredients and method sound just like my popsicle recipes only poured into a pan, frozen, and scraped instead. I can see why it would be easy to scrape it with a fork as my popsicles made with fresh fruit were very soft and easy to bite. Thanks so much for this recipe. I look forward to making my first granita! Next summer, I’ve got to try to make homemade (non-KoolAid) popsicles such as the ones that you inspired me to make! There’s nothing like the refreshment that comes from fruit in a frozen treat! Thanks Mindy, It’s always fun to try new ways of presentation. I need to use martini glasses more often! This is so perfect for July. 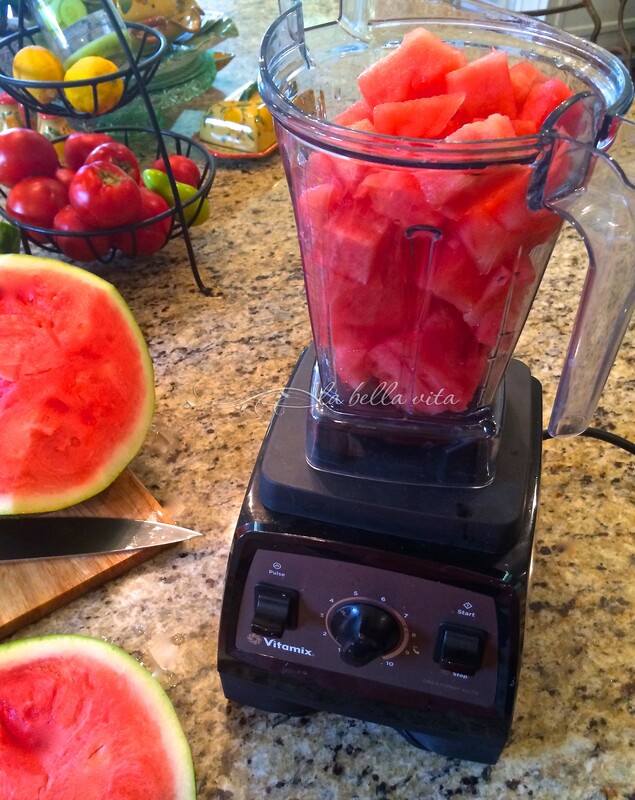 (I can eat 1/2 a watermelon on a hot day…. and do). It’s so easy to make – putting it on my list. Love the simplicity and how it refreshes. Plus – it’s pretty! 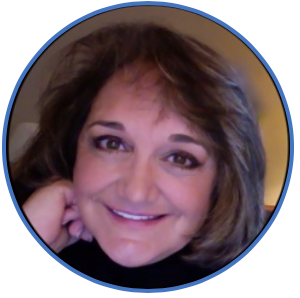 Thanks so much for stopping by Claudia; I always enjoy hearing from you! I can’t describe how much I love watermelon. This looks so good. We had a couple of cooler days but it’s going to be hazy, hot and humid the next few days, so this will be so refreshing. I’m with you on the ‘love of watermelon’ Annamaria! It’s nice that watermelon is available year-round, but obviously not from local sources. I still love it any time! I love that first photo! What a delicious idea for a hot summer day. Gotta try this one! Thanks Susan! Please let me know if you try this recipe! 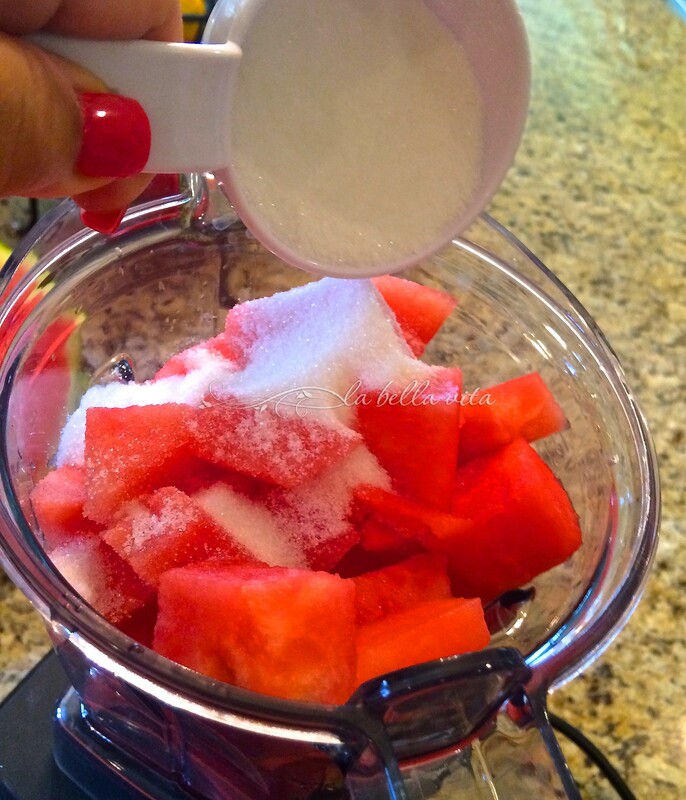 Watermelon is such a delightful granita flavor–perfect way to beat the heat! Granita is so refreshing — I should make it more often. So nice to hear from you Liz! Looks delicious! 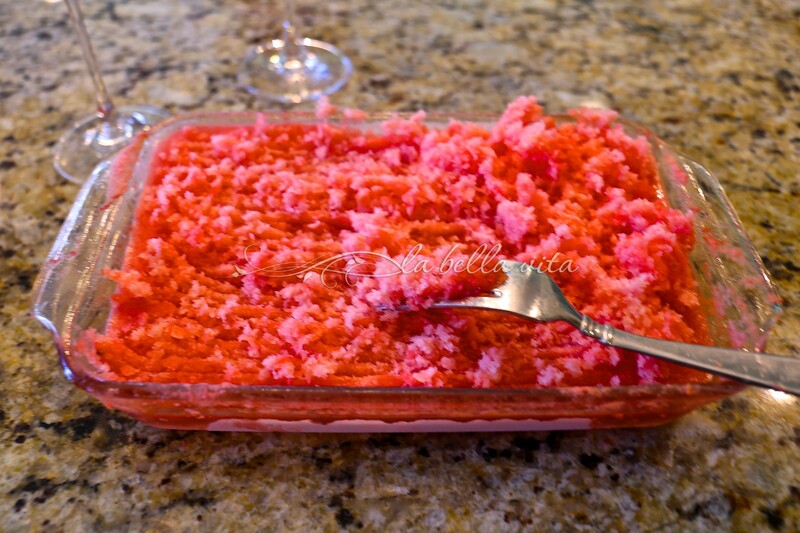 How long will the watermelon granita keep in the freezer once you have scraped it? Can this be made ahead of time and stored for a few days? 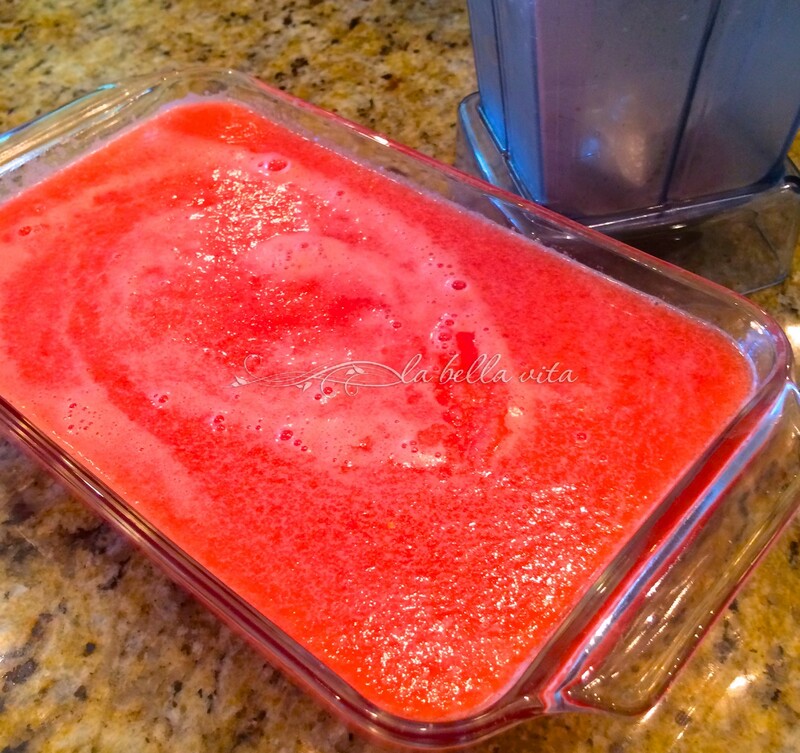 Watermelon granita can stay in the freezer for as long as you like . . . isn’t that wonderful? It’s not like ice cream at all. It’s basically “ICE”, with a watermelon flavor and keeps as long as you like. Thanks so much for such a GREAT question, CC! I hope that my answer is helpful to you! Oh YUM!!!! Usually I blend and then just drink it. Love the idea and freezing it into a granita.